December 1, 2017 /3BL Media/ - UPS (NYSE: UPS) will implement a sustainable delivery concept in the inner city of Frankfurt. 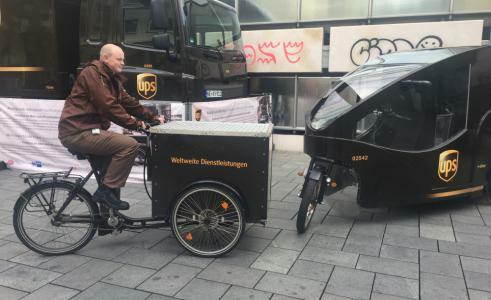 From a micro-depot in the “Meisengasse” street, UPS employees will make deliveries with electrically assisted cargo bikes and on foot. This set-up will replace two diesel vehicles per day. The project will run for a two-year trial phase in cooperation with the City of Frankfurt, IHK Frankfurt, and the House of Logistics & Mobility (HOLM). In addition, two prototype hybrid vehicles will make deliveries in the area around Frankfurt. These hybrids can operate up to 50km on their electric engines, or up to 150km in hybrid mode, allowing both fuel and emissions savings. In case the battery gets low on power, the vehicle uses a regular combustion engine. In addition, it is equipped with a regenerative braking system, allowing the vehicle to regain energy and recharge its batteries. UPS introduced its first sustainable city delivery system in Hamburg, Germany, in February 2012. Every weekday, UPS places four containers at central locations in the city for interim storage of packages for UPS drivers. From these points, deliveries are made on foot or with specialized electronically-assisted cargo tricycles that ease traffic congestion and reduce emissions. This system removes between 7 and 10 delivery vehicles from the city center of Hamburg each working day. UPS has deployed similar inner city delivery projects in Frankfurt, Offenbach, Munich, Oldenburg and Herne, Germany. Delivery projects are also underway in Belgium, France, Ireland and Italy. UPS has invested more than $750 million in alternative fuel and advanced technology vehicles and fueling stations globally since 2009. UPS deploys more than 8,500 low-emission vehicles: pedal power, electric-assisted bicycles, electric and hybrid electric vehicles, natural gas, renewable natural gas and propane. UPS puts sustainability innovation into action, all over the world.